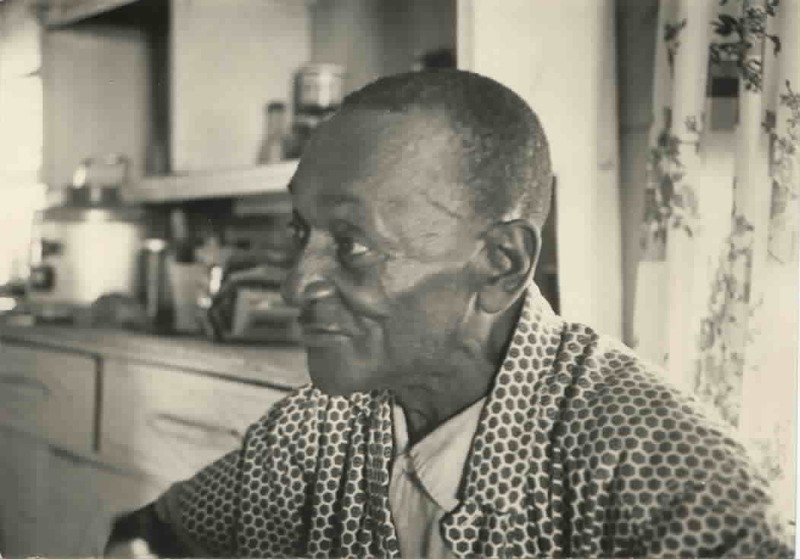 I met Mance Lipscomb around 1964. I had been taking guitar lessons in all different styles from folk to flamenco to classical. 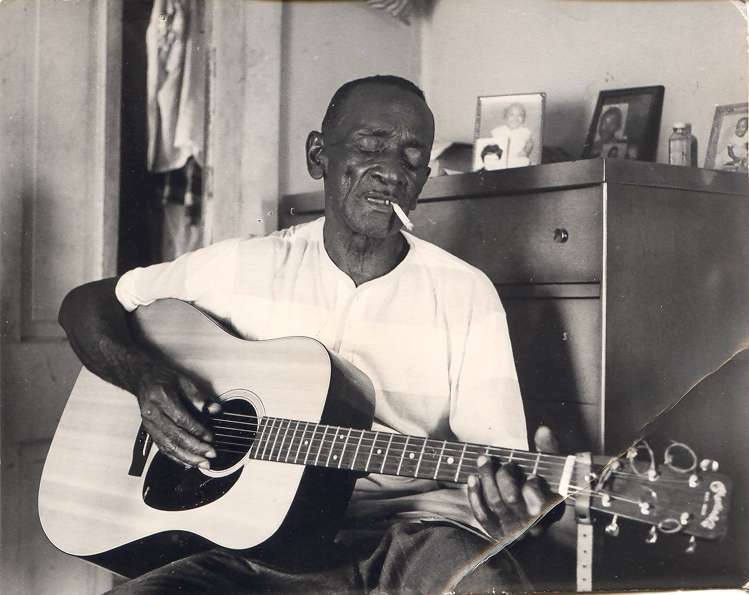 But I loved the guitar style of Mance Lipscomb best of all. I was learning how to play his music by applying techniques I had learned in lessons to careful listening of slow speed, note-by-note playback of the performances on his first record. When Mance was to appear at the Ash Grove (a nightclub run by Ed Pearl that featured folk music), Bernie Pearl encouraged me to introduce myself to Mance. Bernie said that Mance was very nice, and he suggested that I peek in the dressing room between sets. Mance listened to me play, picked up his guitar and joined in, and we immediately began to call and reply musically within his style. We got along personally as well as musically, and after the club closed, we went out for pancakes in the early morning, a late night breakfast that we repeated many times over the years. 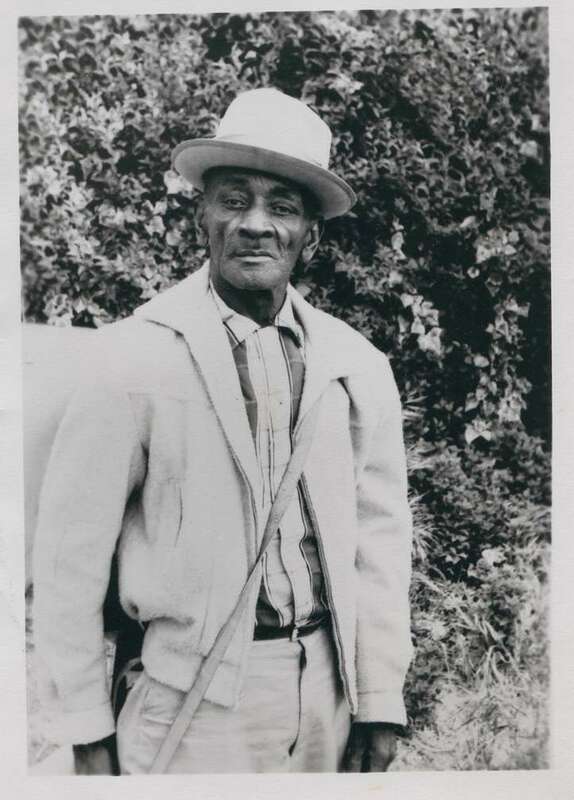 I invited him to my house for dinner the next night, and I learned that Mance stayed in motels while traveling, which reduced his take-home pay from tours. After that, Mance accepted the invitation to stay with me when he was performing in Southern California. 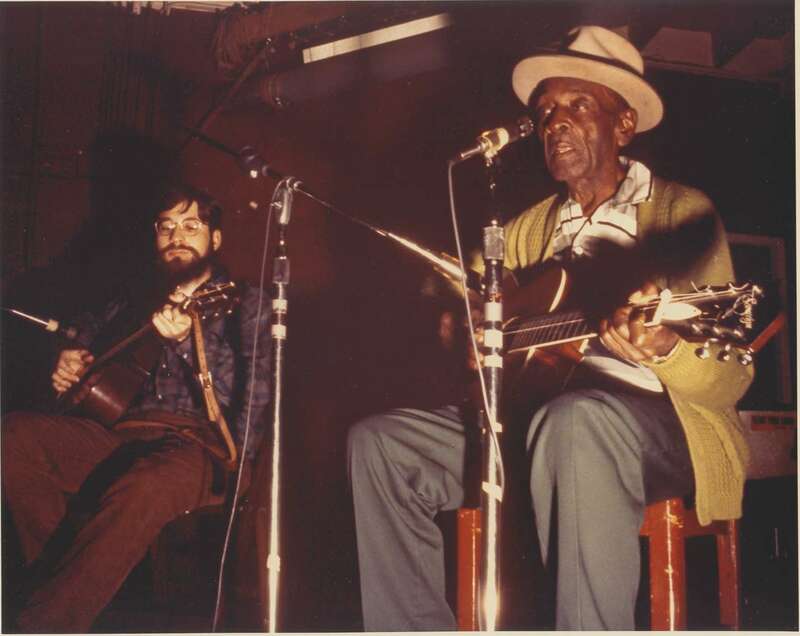 These visits were most often when Mance had gigs at the Ash Grove, but also there were gigs at McCabes and perhaps also the Troubador. We performed together on a number of occasions at various venues, many times at the Ash Grove, and at one gig in the Avalon Ballroom in San Francisco during the days of hippies and flowers (maybe 1967). Janis Joplin with Big Brother and the Holding Company, and the Family Dog Lightshow were also on the bill. The audience of thousands sat on the floor as one and listened intently and quietly to our sets, giving rousing applause. It was something one could not forget. I recorded with Mance as "Guitar No. 2" for his Arhoolie Vol. 5 album in Berkeley on Baby, you don't have to go. That session was recorded in 1969 and was reissued in 2002 on CD by Arhoolie. The first group of pictures below were taken in the Summer of 1966 to my best recollection. 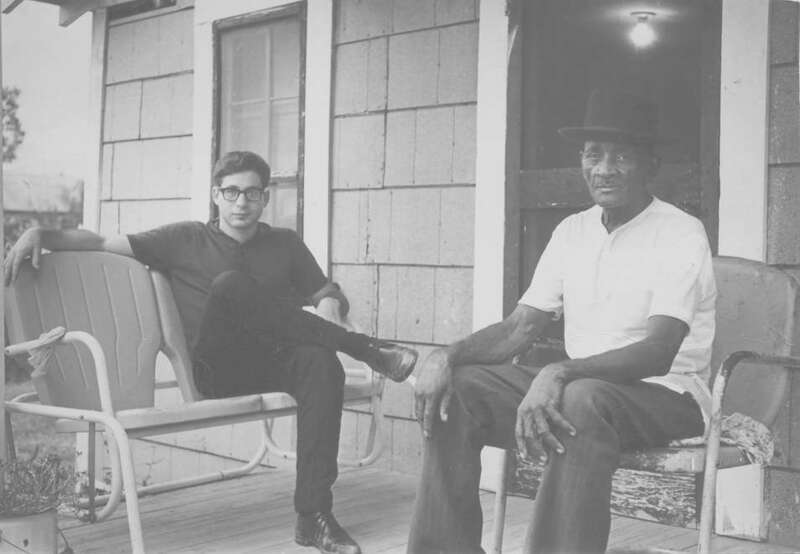 Mance invited me to visit him in Navasota that summer; I was 20 years old. I was accompanied by my friend, Eddie Iwaki, who took the first group of pictures below. Eddie and I recorded a number of interviews with Mance. Mance and I performed at a local "juke" joint in Navasota, where the audience was VERY enthusiastic. It was my most enjoyable performance with Mance. In the above picture, Mance is playing my guitar in his bedroom. 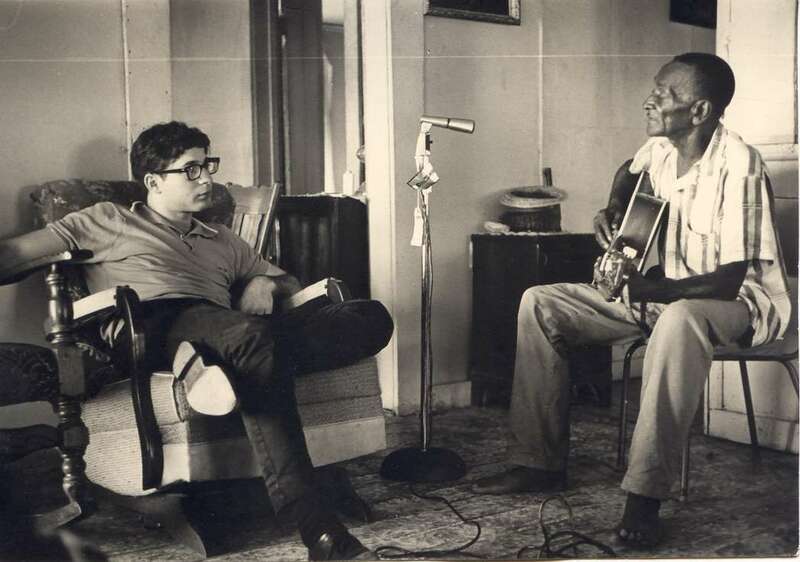 The above picture shows my slouch as we interviewed Mance in his living room. 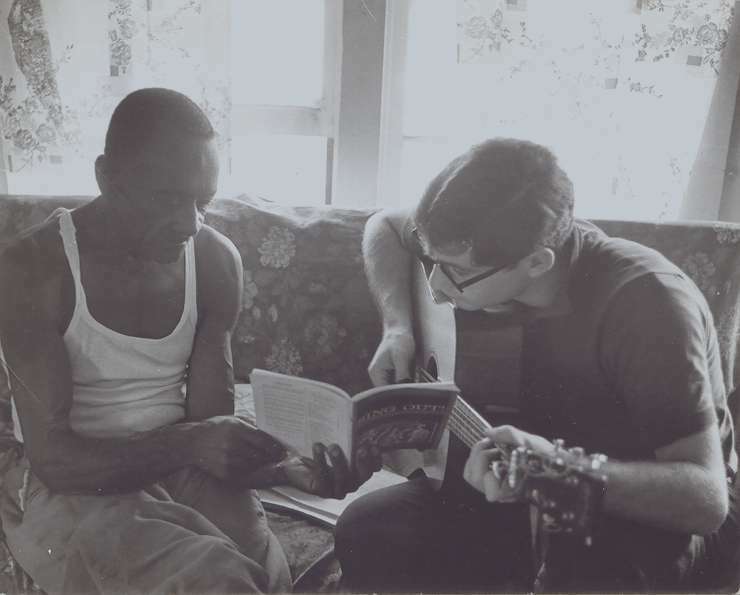 Also in his living room, Mance asked me to play some music from "Sing Out", a folk song magazine of that era. I forget now what the song was, but I recall that it was something in a style completely different from Texas Blues--perhaps it was an English ballad. As I recall, Mance had heard another folk singer do the song and he wanted to learn that "purdy" song. This picture was probably taken sometime between 1970 and 1972. 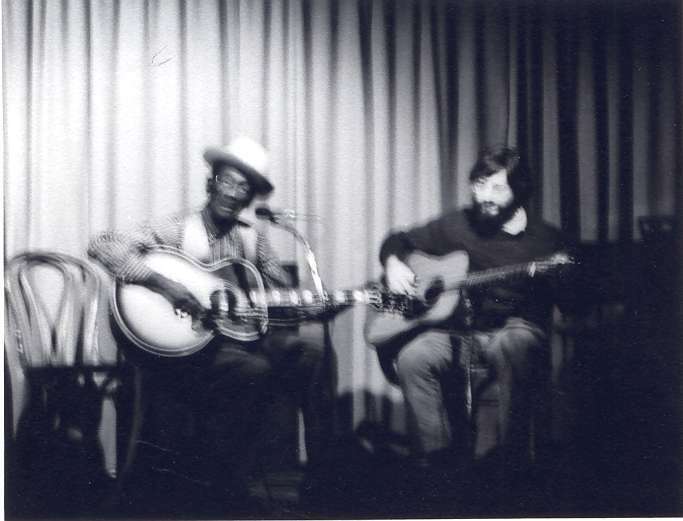 I believe that this shows us performing at the Ash Grove, and the picture was probably taken by Dan Rose, husband of Barbara Rose, who was a student with me at UCLA. I think that the above picture shows the last time that Mance and I performed together on stage. It was probably in 1974. I had moved from Los Angeles to Encinitas for my Postdoctoral studies at UCSD (72-73), then to Kansas State University (73-74), then to University of Illinois (74-88). My memory is that I was back in LA on a visit, Mance was to perform at McCabe's in Santa Monica, and he invited me to join him on the stage. In this picture, we can see Mance's new guitar that he played in the last years of his life. 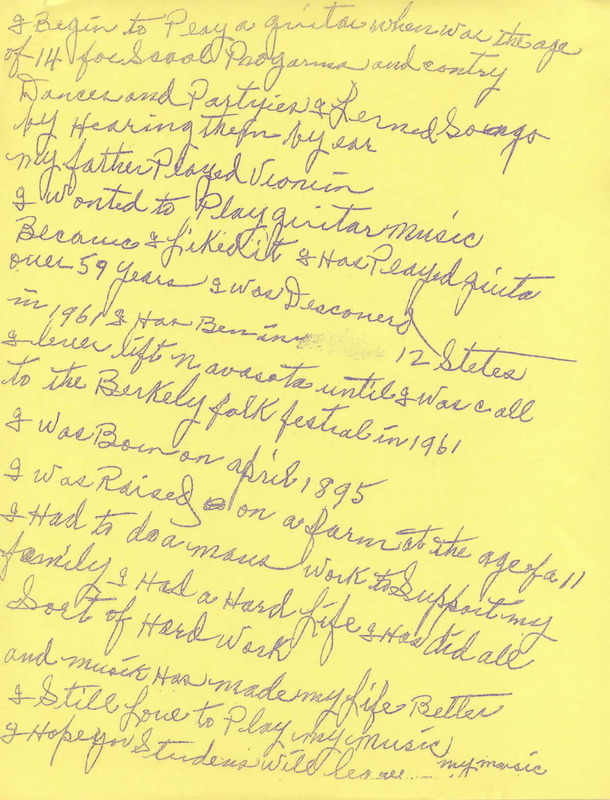 I received a letter from Glen Alyn (then Glenn Meyers) relating Mance's illness and death in 1976. About 20 years later, Glen's book on Mance was published. I traced Glen through the WWW, which was then still fairly new, I arranged a gig for Glen here at CSUF in 1996, and Glen and I finally met. It was like meeting an old friend--we had so much to talk about and it was like Mance had never left us. Sadly, Glen was killed in a tragic accident a few years later. It is too bad that this picture was not in better focus. I don't recall who took it. Dear Mike: I Rec your letter. I am always Proud to hear from you and Bonie, your wife, and to no you all are ok. Mike, that was a nice Palm (poem) you wrote in the letter. And about the book the girl is writting about me, when I see her again I will tell her what you said. (MHB: I wish I could remember what I said) She goes to austin Texas school at the univeristy. I will you no when I see her again. Mike, the song me and you are Playing together on the No. 5 Record--People Loves it. They Say you is Raily Backin me up the Song O-Babie you dont Hafter go. Mike, I am Still going Places to Play. Give my Best Regard to all your mother & dad, also to Bonies Parents. My Wife sent Helo to you & to Bonie as you all Has Ben So nice to me. 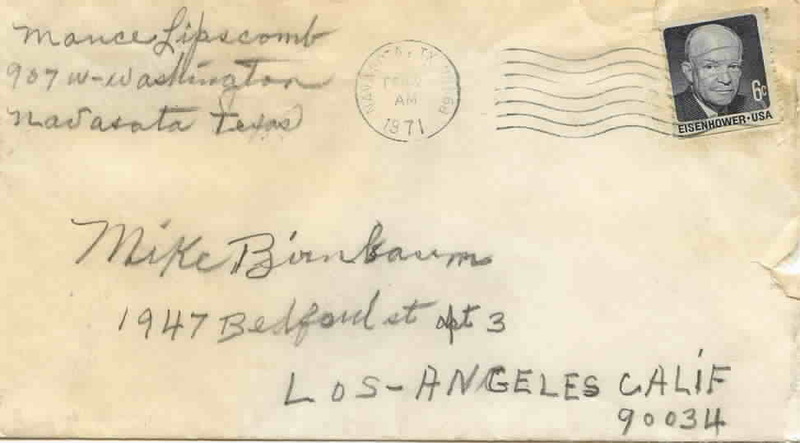 The above envelope reminds me that my wife and I lived in a garage converted to an apartment from about 1968 to 1972. There was a kitchenette and a living room-bedroom, a small hallway with a narrow bed that we called "purgatory", where Mance slept when he stayed with us, and a bathroom. Before that (maybe 66-67), I had lived in a room near an oil well that made noises all night. Mance and I slept on mattresses on the floor. Mance and I joked that it sounded like they were trying to pull the oil up with a chain. Previous to that, Mance stayed with us at least once in my parents' house. I recall that we were at my parents' house when he told me of the passing of John Hurt--that was perhaps November, 1966. We were either staying then with my parents or we were there for dinner. Navasota Texas. 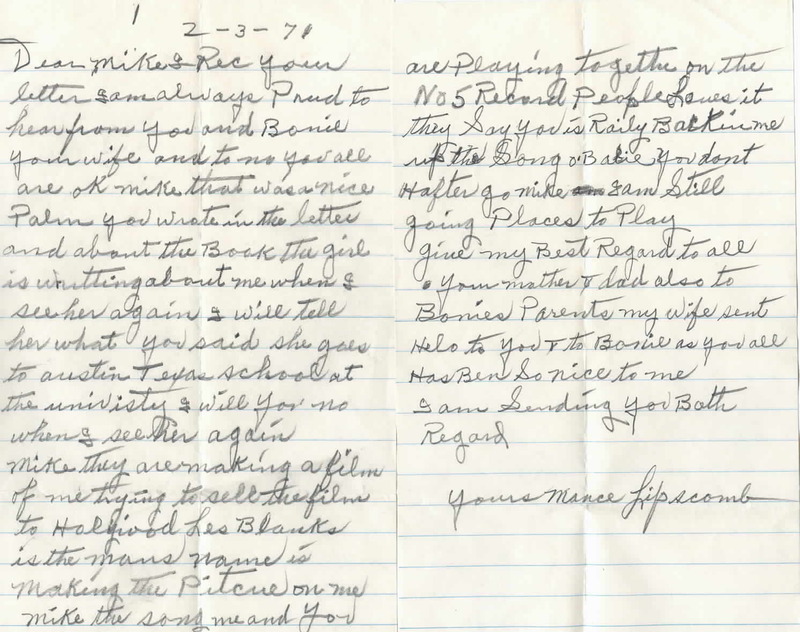 Dear Mike: I Rec your letter and the Song you Sent me, thanks. I am always Proud to here from you, and your Parents, also to here from Bonnie as she is Such a Sweet girl. I wish you and Bonnie all the Happy Hours together. I Ben Playing Verry often at Home. I am Booked in Kansas April the 28th 29th with Dock Watson and others. I hope you all injoyed Sony and Brownie McGee, they are Both Wonderful and are my friends. Give your Parents my Best Regard and to Bonie I Hope You are Well of the flue. by Hearing them by ear. in 1961. I Has Ben in --- 12 Stetes. to the Berkely folk festial in 1961. I was Born on April, 1895.
and musik Has made my Life Better. I Still Love to Play my music. I Hope you Studens Will learn my music. Above is my favorite picture of Mance, and perhaps his as well. He gave it to me, I think, in 1965 or 1966. I don't know who took it. 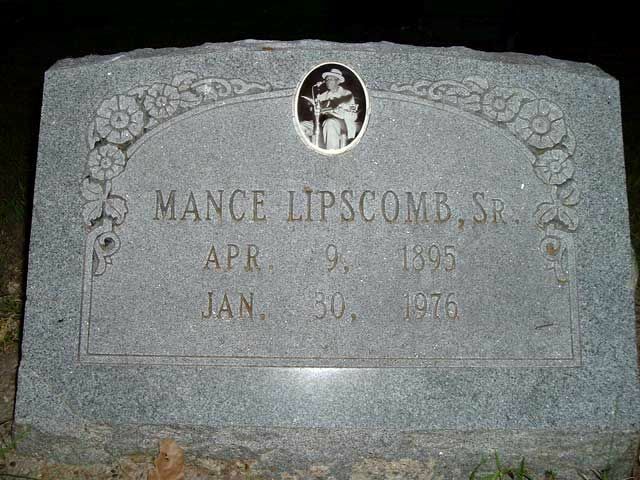 The picture below shows Mance Lipscomb's grave marker in Navasota, Texas. The picture inset on the gravestone was apparently taken from the picture of Mance and Me playing at the Ash Grove (color picture above). Some DVD videos showing Mance Lipscomb performing are available from Stefan Grossman Guitar Workshop, which also has guitar instruction lessons of all types and many other related videos, DVD, and CD titles.